During March last year Dave went from being able to climb mountains to only able to move his eyes, as a result of a devastating brain stem stroke. 2018 was not a good year for several reasons but, for me, the cruelest blow came in March when I suffered a brain stem stroke following a ski fall. To say our world has been turned on its head would be a mild understatement. Whilst I've not lost any cognitive function my motor control was reduced to blinking. I'm not going to dwell on the negatives, hardly the thing for the start of a new year, but while Hannah is keeping the show on the road in the most humbling way imaginable my role has been reduced to fighting for every bit of motor function I can get back. It is a huge mountain to climb and I am still at the bottom but climbing mountains is what I do and with progress so far I am at least over the bergschrund. I also know I have benefited from a huge amount of support from the start from friends near and far. I am truly grateful and my state of mind is better for it. As Dave says himself he is at the beginning of a very long climb. Compared to where Dave was last March, where he only had eye movement, he has made huge amounts of progress. His attitude, positivity and ability to look forward is incredibly impressive for all to see. Dave now has small amounts of movement in all limbs, is doing some standing with support and is on a motorized bike. His facial paralysis and locked jaw continue to be a frustration, but he is constantly working on improving that and he is still using his eye gaze system to communicate. The decision was made by them early on that Sheffield would provide Dave with better neuro re-hab options than their hometown outside Inverness, and also provide his wife Hannah and their two boys a network to support them all while they are in Sheffield. Dave has an NHS funded place in an impressive neuro-rehab facility called STEPS and NHS Highland are funding his place on a (so far rolling) 3 monthly basis. With the progress Dave is making he is hoping this will continue for the medium term, but the funding for this is not certain. Hannah has been the most incredible wife, nurse, friend, advocate and mother you could possibly imagine. Hannah and the boys have been living in Sheffield from April until now (Jan 2019). 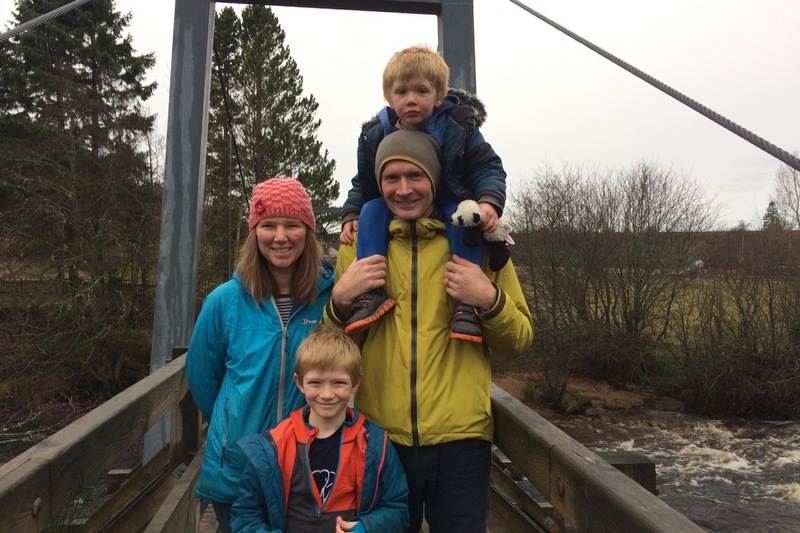 Hannah and Dave have made the difficult decision that in February 2019 Hannah and the boys will return to Carrbridge, Scotland to return to work and to start her PhD and for the boys to return to school, their home and friends. Dave will remain in Sheffield for as much rehab as possible. Dave’s goals are to walk, eat a Sunday Dinner and bake Hannah a cake (as this all happened just before her birthday last year.) There’s a long, long, long way to go but he certainly feels that he is making small movements in that direction. As you can see from his Facebook message Dave is looking forward and upwards. His determination as we all know is out of this world. The Physios and other staff at STEPS are getting excited about his progress and attitude to his rehab. It’s going to be a long haul and continue to be a roller-coaster of a ride. A lot of folk have asked about wanting to chip in and make contributions to the Hollinger Mission. Dave and Hannah have both not felt entirely sure about this. But now they are coming up to a year on from the accident, they can both see that a sort of “trust fund” for Dave for equipment such as an off road wheelchair that could enable him to take the boys orienteering one day soon or funding for additional ongoing physio once his time at STEPS ends would be really helpful. Hannah especially wants to be VERY clear that this fund is for equipment and physio for Dave. She doesn’t want folk to think she’ll be spending it on going on holiday- as if! But they both definitely deserve a very long one! This has been written in consultation with Hannah and Dave, as I’m sure you will understand it’s a difficult thing for either of them to write themselves. If you would like to contribute please do so. Or if you feel inspired to do a sponsored climb, walk or event please even better! It would be great to hear what everyone has been getting up to and for Dave and Hannah, Finley and Toby to see which mountains Dave is inspiring others to climb! 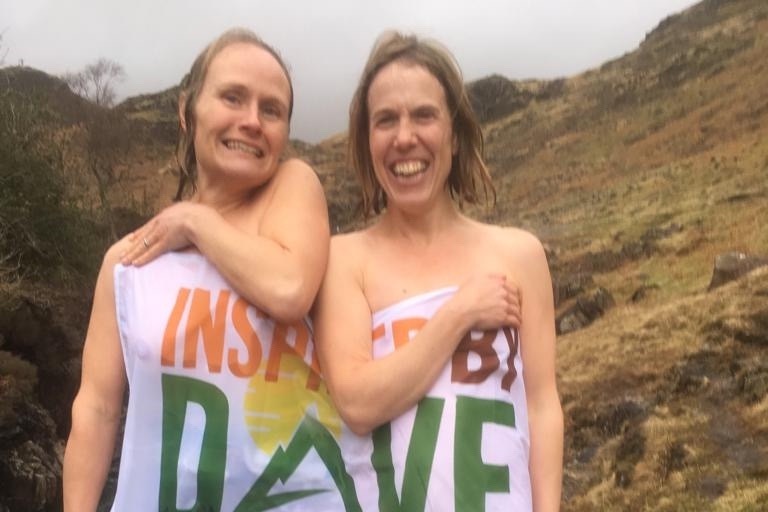 It has been a month since the start of the 'Inspired by Dave' campaign. I can hardly believe the level of support it has created in such a short time. I've been very moved by the generosity of everyone who has donated as well as others who have been in touch and those with some fundraising plans already under way. A big thanks also to those involved in designing the super logo... and of course the models! Hi it is Dave here. I'd like to say a heartfelt thanks for your kind donation. This will make a difference in the months and years to come and I will be sure to keep updates on how you have helped make things better for us. Thank you again, Dave.